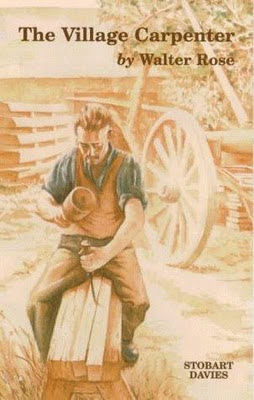 The village carpenter is easily one of my favorite books. It's a book that makes me long to be born in a different time where craftmanship was appreciated and skill was hard earned. I love to re read parts of this book and it really inspires me to try harder in my trade. The reason I mention this book is because something minor happened that reminded me of it on site today. There is a lovely sad bit in the book where Walter Rose describes how he lent his saw to labourer to cut wood and he later found it broken, when he talks about this saw you can feel how much this misuse hurt him. Well today I lent a labour a chisel - it will now have to be re-ground (big chunk missing). This doesn't bother me too much, but the misuse and treatment of the tool does, I hate lending my tools to people but when I do I hope they treat them with the same respect that I have for them, normally they don't! This coupled with the fact that I've been putting UPVC fascia on (in the rain) to a new extension where the brick work isn't even anywhere near level leaves me with little doubt about where the British builder stereotype comes from. Hello Alviti, thanks for the comment on woodturningblog. You have an interesting blog here, with lots of variety. Good luck with the turning, and when you see Chris next tell him Andy Coates sends his best regards. He's a good man and you couldn't have a better tutor. I'll be seeing Chris in the new year so I'll give him your regards. Your blog is a really interesting, love the hollow forms you've been doing. What goes on behind those walls?